Definition at line 106 of file AsyncJobCalls.h. Definition at line 109 of file AsyncJobCalls.h. Definition at line 110 of file AsyncJobCalls.h. Reimplemented in CommCbMemFunT< C, Params_ >, BodyConsumerDialer, and BodyProducerDialer. Referenced by CommCbMemFunT< C, Params_ >::canDial(). Definition at line 121 of file AsyncJobCalls.h. Definition at line 114 of file AsyncJobCalls.h. Definition at line 118 of file AsyncJobCalls.h. Referenced by Ipc::Inquirer::HandleRemoteAck(), sslCrtvdHandleReplyWrapper(), and Ssl::CertValidationHelper::Submit(). 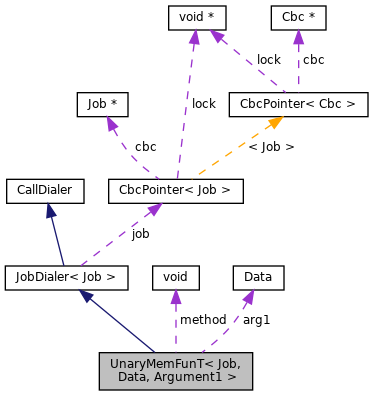 Referenced by JobDialer< BodyConsumer >::canDial(), JobDialer< BodyConsumer >::dial(), NullaryMemFunT< ModXact >::doDial(), UnaryMemFunT< BodyConsumer, BodyPipe::Pointer >::doDial(), and JobMemFun(). Definition at line 117 of file AsyncJobCalls.h.